Diversity can strengthen partnerships, since it brings a wider potential range of available resources and capabilities. However it also brings contrasting logics and interests, conflicting values, diverging expectations and approaches to value creation. 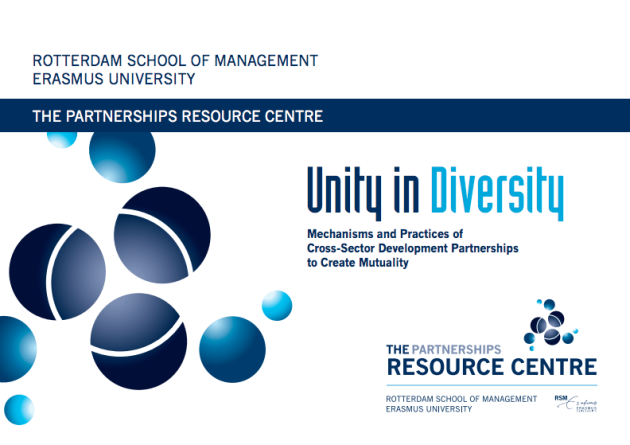 Based on seven cases of cross-sector partnerships with the private sector facilitated by the Dutch Embassy in Colombia, this report explores how these partnerships have dealt with organisational diversity in practice. The findings highlight the need to create collective and individual value while preserving the diversity that characterises partners. This booklet introduces a model that depicts key mechanisms to facilitate this process, as well as practices that partners can develop to put such mechanisms into action. Four of these mechanisms are then explored in more detail to show how partnerships can achieve higher levels of mutuality in practice. These are: coordination, accountability, partnership collective identity and transparency.